We begin the final two weeks of interviews with Council Member Ronald Green, who is the first of the City Controller candidates I spoke to. Like his opponents in the race, Green is term-limited out of Council, where he is the incumbent in At Large #4. 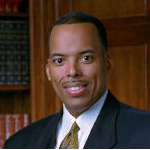 Green is a native Houstonian and an attorney who is the founding partner of his own firm. He has been the chair of the Budget and Fiscal Affairs Committee (he is current serving as a member), which oversees the city’s budget. His wife is Justice of the Peace Hilary Green.